Whenever Easter rolls around I get a kick out of seeing all the Easter candy at the store. 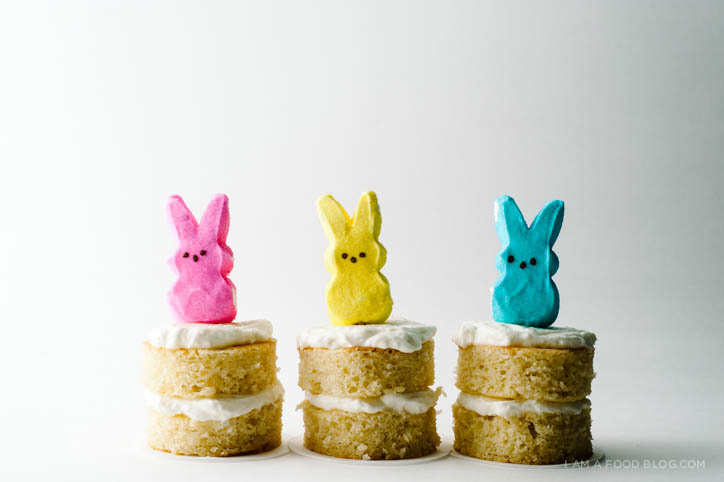 I’m not a huge fan of candy — I didn’t even taste Peeps until I was well into my twenties, but I do love pastels and marshmallows, so Peeps are definitely my Easter candy of choice. I just can’t resist those neon sugar covered squishy bunnies. 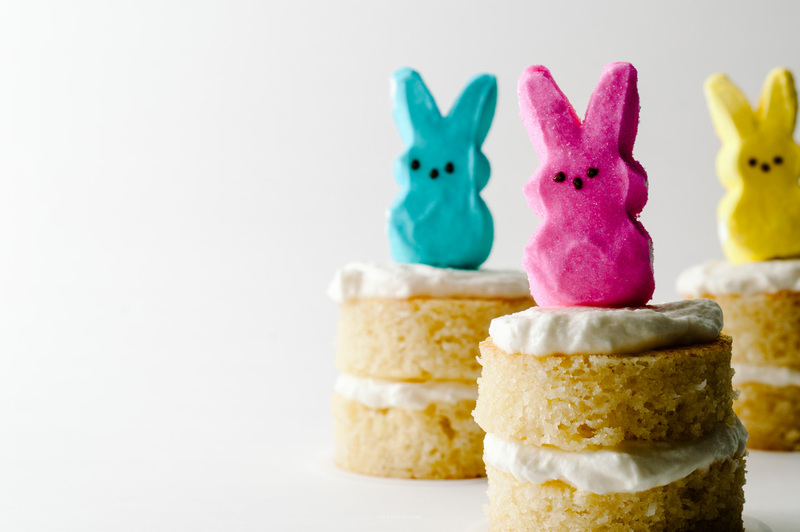 And yes, I know Peeps are called Peeps after the marshmallow chicks, but I think the bunnies are so much more iconic. Luckily, I found some bunnies at Vons. And they didn’t just have one color, but three! I was ecstatic. Seems like an extreme emotion for Peeps I know, but I had an idea of how these mini cakes were going to look like in my head and I was determined to make it happen. 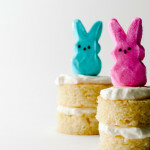 But even after finding my Peeps, it seemed like the world was conspiring against my coconut cakes. See, my favorite coconut cake recipe calls for unsweetened shredded coconut, which is strangely uncommon here in San Diego. It’s kind of funny because there’s a large selection of shredded coconut in Canada and I was more than a little surprised that it wasn’t something in the regular baking aisle. While there was a dearth of unsweetened shredded coconut in the baking aisle, there were bags and bags of the sweetened stuff. I wasn’t going to let a little sugar get in the way of me and my cake, so I decided to go with it. There’s only a quarter cup of coconut in this recipe so to be honest, it doesn’t make much of a difference, but if you’re sensitive to sugar, feel free to reduce the sugar by a tablespoon or two. From what I can recall, the sweetened vs. unsweetened coconut didn’t change much — the main difference was that this cake was a tiny bit more moist. I’m a card carrying member of the mini cake club and I’m loving it! Cookie cutters make it so, so easy to cut a sheet cake into rounds and as a bonus you get cake scraps to snack on. 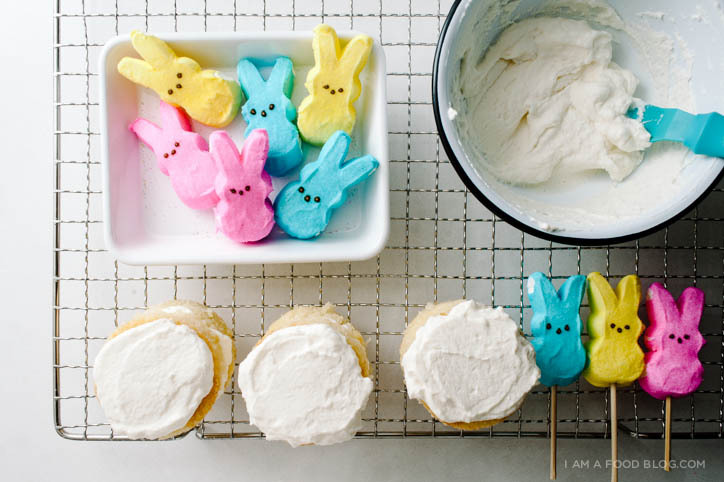 The Peeps are optional of course, but they add a little bit of Easter bunny cuteness so I don’t see why you wouldn’t. Plus it’s kind of fun putting toothpicks up their little bunny bums! Preheat the oven to 350˚F. Line your pan with parchment paper. I used an enamel pan that measures 11″x9″ and was able to cut six two-inch rounds, with quite a lot space inbetween. You should be able to use a 11″x7″ pan and cut out 6 rounds comfortably. Sift the dry ingredients and set aside. In a liquid measuring cup or small bowl, mix together the coconut milk and vanilla. Cream the butter and sugar together until light and fluffy. Add the egg and egg white and mix well. Add dry ingredients to butter mixture in 3 additions, alternating with wet ingredients and ending with dry. Do not overmix. Pour the batter into the pan and bake for 20-25 minutes or until a toothpick inserted in the middle of the cake comes out clean. Cool completely before removing from the pan. Make the frosting: Cream together the mascarpone and sugar until light and fluffy. Whip the cream until soft peaks form. Gently fold the whipping cream and vanilla into the mascarpone. When completely cool, use a 2-inch round cookie cutter and cut out as many rounds as you can. Top each round with mascarpone frosting and stack them up. 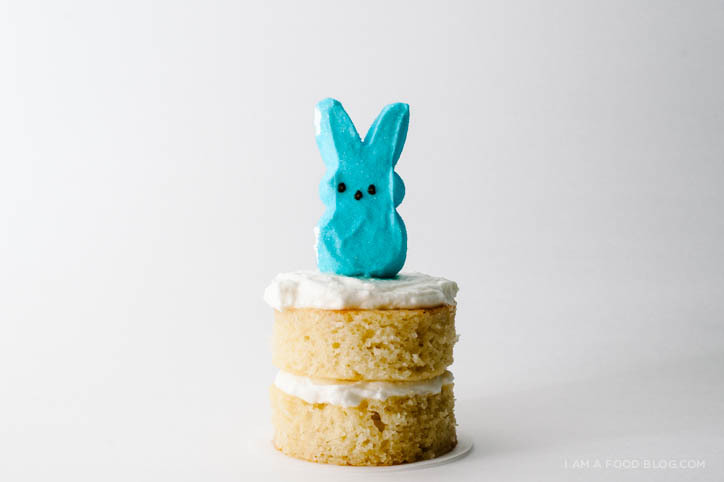 To top with peeps, spear a bunny on a toothpick and push into the centre of the cake. Some of my other favourite mini cakes around the web: Mini Matcha Cakes, Rainbow Mini Cakes, Mini Chocolate Cakes with Hazelnut Buttercream. Gah! These are the cutest cakes I’ve seen all week. So adorable! 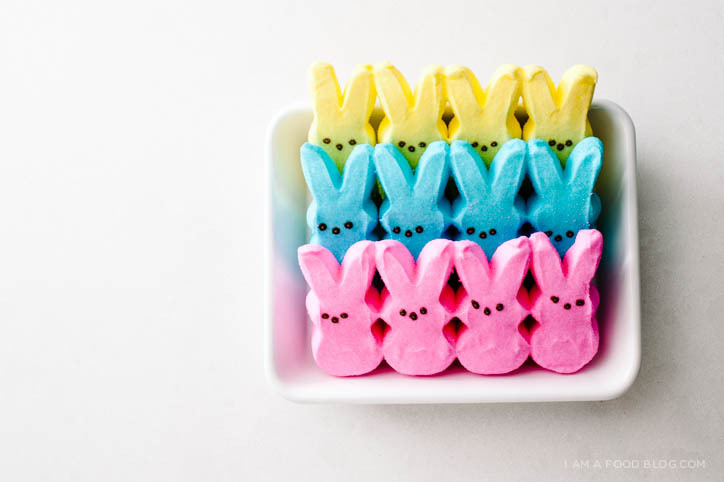 I’m such a sucker for Peeps (sad but true). 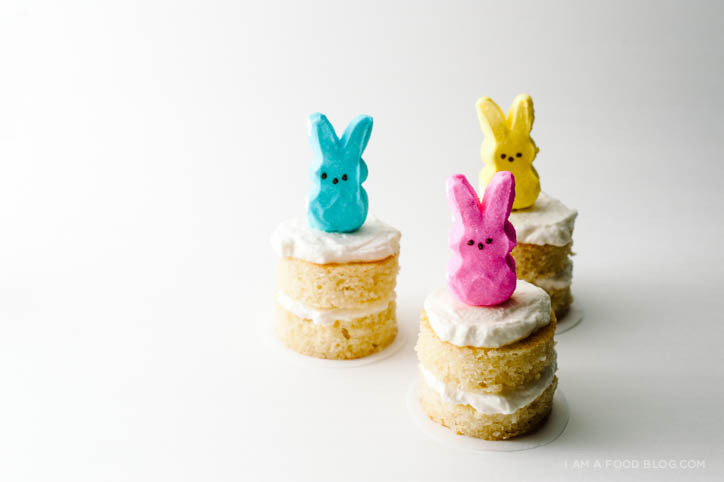 These little cakes are ridiculously adorable….and a nice reminder that I have got to get myself on the mini cake wagon! CONGRATS ON WINNING BEST COOKING BLOG ON SAVEUR!!! SO HAPPY FOR YOU!! Hahaha “bunny bums”! 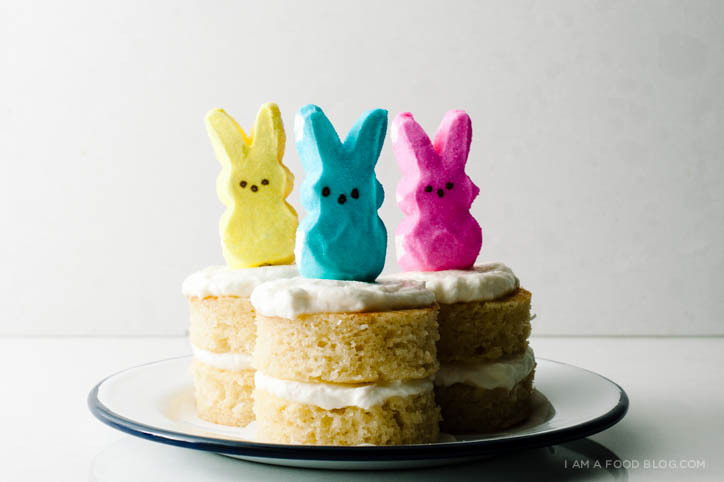 These cakes are so cute, Steph! I love coconut, and happy that you substituted the sweetened-flaked as I have had trouble finding unsweetened as well here. Love the tiny cakes and the colorful toppers! Darling! 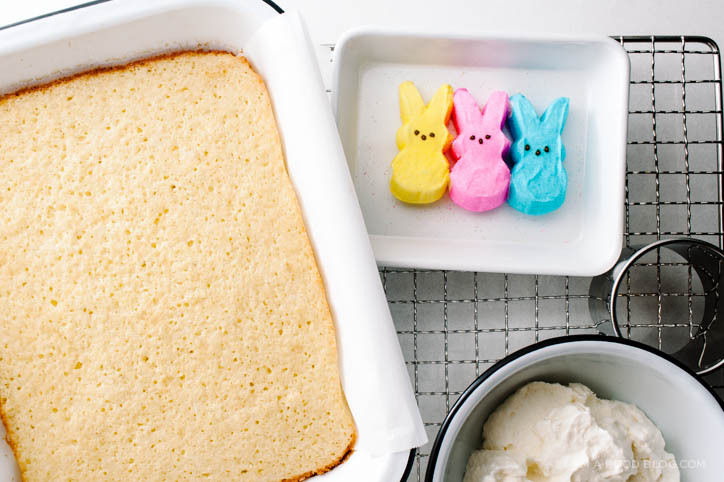 This is adorable, and I think I may make them for Easter weekend (I have a 4-year-old who will swoon for them, I think). Just to double-check: is it 1/4 c.+ 2 tbsp with the coconut milk? There was no measure designation after the 1/4, so I figured I should ask. Congratulations on the Saveur award–that’s actually how I found you! Congrats on the award!! HUGE fan, love the site! full stop. Quick question – canned coconut milk (full fat) or would the refrigerated “kind-you-pour-in-smoothies” work? Thanks!! So cute so cute so cute so CUTE!!!!!! And so perfect for Easter! I love it, Steph. And the hugest of congrats again, my dear friend. I’m so sosososo excited to meet you next month! Just don’t be surprised when my fangirling becomes awkward. Oh Cynthia, you could never be awkward! Me, on the other hand…. :p I’m so excited to meet YOU! … just jumpin’ in to say CONGRATS on your award — so completely deserved!! I’ve been enjoying this space for the past few months and was thrilled to see that your work was recognized in such an awesome way. Hooray!! Thank you so much Brigitte! I still can’t believe it, to be honest! Brilliant idea to use cookie cutters for these cakes! And congrats with the Saveur award: so well deserved!! Thanks so much! Using a cookie cutter = cake scraps! PS. CONGRATS ON WINNING SAVEUR!!!! You’re amazing. I live in San Diego too & I usually buy unsweetened coconut (shredded or flaked) at Whole Foods and Bristol Farms. These cakes look fab! I made the recipe today, and the 4-year-old I mentioned in my earlier comment thought it was great fun to stick bunnies on the cakes. I used Martha Stewart’s proportions so I could make a 13×9 sheet cake and a few more cakes . . . it ended up making 5 not-so-little 3-layer cakes where each of the higher layers was a little smaller than the one below it (I have a 3-cutter set of biscuit cutters in graduated sizes–3 inch, 2 inch, 1 1/2 inch), and with a doubled recipe of icing I have some left over. One observation: holy cow is this a rich little cake! Next time I’m definitely sticking with 2 layers . . . the 4-year-old and I weren’t able to finish even a single cake by ourselves, even with a little help from my husband. Fortunately my mother was having dinner with us, so we were able to send some home with her, but we’ve still got 2 and 1/3 cakes in the refrigerator! Even I made peeps cupcakes this year for my son and his friends. The reason was kind of same they are so cute to resist. Love the post.